- "Then why are we following Elliot?" - Sirleck gets a report on the "forgetful immortals"
No kidding about that "finally" part. I was originally figuring these guys would make their move in 2011, but then I got other ideas and, well... But hey, I was only off by about six actual years! Could happen to anyone. I was concerned I was going a bit over the top with those narration descriptions in the comic, but looking at all the references... Yeah, I regret nothing. 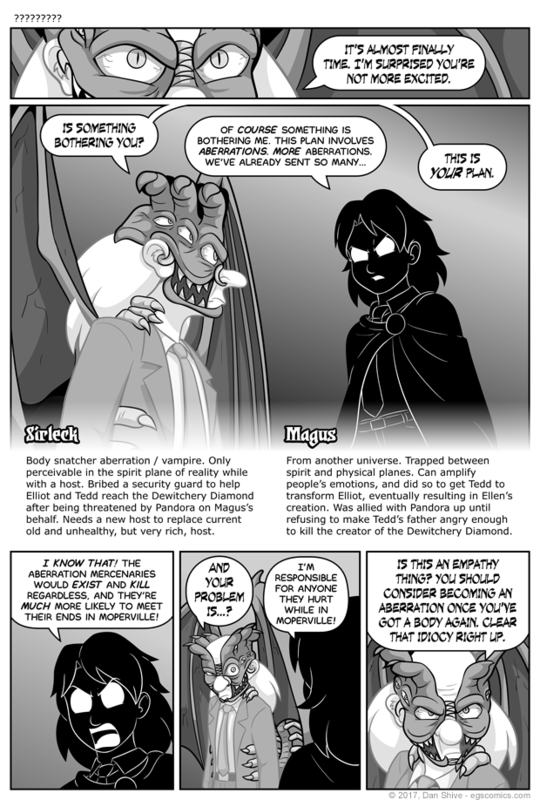 Either way, the only difference the narration makes to this comic is, well, it being there, and Sirleck and Magus not bothering to refer to each other by name. Otherwise, the script would be the same, assuming my desire to remind people of everything mentioned in that narration didn't result in terribly forced dialogue about all of those details. For the record (because I am psychic and know how some will respond to this), I care about more casual readers being able to follow the story, and as much as I want to avoid recappery when able, there are times when I feel it should be there. Speaking of reminding people of things, the mouth of Sirleck's host remains closed in this comic because it is Sirleck talking directly, and not via the host. No one on the physical plane would be able to hear him talking in this manner.